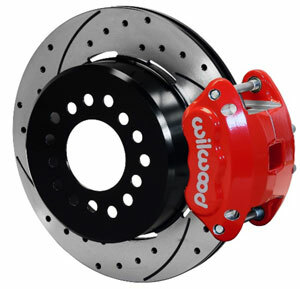 Compliment that front Wilwood D52 kit with this 12" rear kit that utilizes the new D154 caliper. Rotors are multi pattern and fit 5x4.5, 5x4.75 or 5x5 lug circle. Available with black or red caliper. Kits come standard with drilled one-piece rotors and black calipers. For red caliper, add (R) to end of part number. Inquire for plain rotors and other rear ends. Brake hoses sold separately.